Work woes, relationship stress, mercury retrograde… whatever. We all have our moody moments, but if emotional turbulence takes up the better part of 24/7 it’s time to take a deeper look. Last month, we ran this story on the Chinese body clock. Intrigued further by the mind-body connection, we were fascinated to learn more about the relationship between specific emotions and our internal organs. Acupuncture expert, Mona Dan of Vie Healing, is here to tell us more about the connection between emotions and organs. Your emotions feel like they’re all over the place. Each month that passes, you may feel something a little different. Maybe one month you’re moving from a place of fear or place of sadness, while another month you may be angry or just apathetic to your environment. Have you ever wondered why? Yes, of course, depending on what you’re experiencing in your daily life one is more prominent than the other; however, there is a deeply rooted reason why one emotion may be showing up more another. 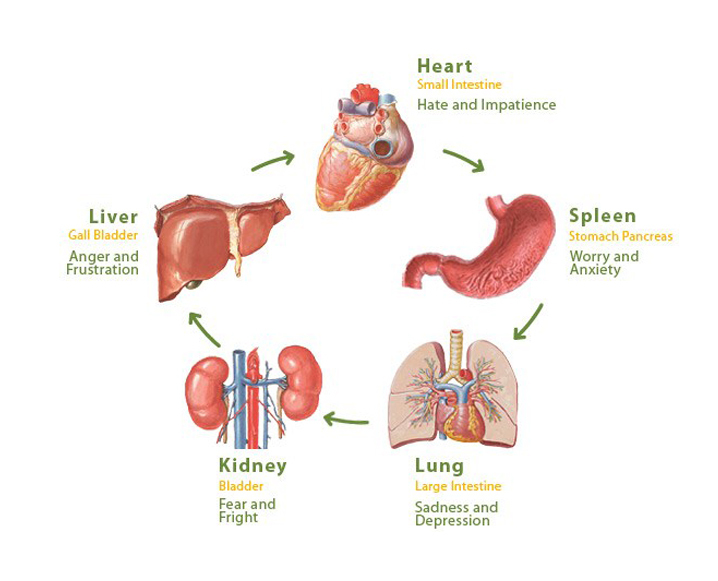 The health of your organs plays a big role in the expression of emotions! Think of it this way: Most alcoholics have a short temper and are angry. Anger is the main organ of the liver. For most alcoholics, their livers are taxed and are crying out for help. Below we can dive in a bit more about each organ, their expressed emotions and what symptoms you may be dealing with. There are 7 emotions we differentiate between in Chinese medicine. It is important to know that organs have strong relationships with one another, so if one is affected, the others are too. Excitement/mania is the main emotion of the heart. When someone experiences highs that are too taxing, they burn out their nervous system. Symptoms of palpitations, insomnia, unclear thinking or excess risk taking may be the expression if someone is running manic. Mania is more common than people think, because most people consider the term emotional with someone who’s running sad or low. Mania on the outside just seems like this person is very happy and excited about their life and cant relax their mind or they may be just the type of person who can’t stop talking and falling off the deep end during conversation. Obviously, balance is everything; with the highs, you also want to experience calmness in life as well. Calmness will counter balance this and relax the heart. The organ responsible for this emotion is the liver. Anger has many expressions: resentment is one, frustration is another and obviously rage is an extreme. Symptoms that may show up are, blurry vision, dizziness, headaches that are mainly on the top of the head, high blood pressure or pain in the ribs. The best way to balance out anger is to console it and understand it. This may cause sadness, however that is a great start, because you’re moving in the direction of anger reduction. Fear is directly associated with the kidneys and the adrenals. It makes your energy drop and is very descending in nature. If the adrenals are weak, your body starts cooling and proper functions of processes like metabolizing become an issue. Proper digestion starts deteriorating. Issues with hearing can also be related to the kidneys. If fear is consuming you and your life focus is centered around fear, these are most likely the issues you’re dealing with. If you can turn this fear into a logic expression of sadness, that means your body is shifting and hopefully soon, that sadness with shift to a more neutral state. Shock is paired with the gallbladder, and these emotions scatter your energy. When your energy is scattered and not centered, you feel symptoms of indecisiveness, confusion or a lack of courage. You may experience different muscle/tendon issues as well. Protecting yourself from scattered energy is very beneficial. The issue with shock is that it usually creates a more lasting effect, so understanding what caused the shock and bringing more logic to the issue can relax the body. Practicing being in the moment through mindful activities like meditation is great too! Grief or sadness corresponds with the lungs. The emotion of sadness is very depleting to the body over a long period of time. It weakens the nervous system, while reducing energy in the body as well. Symptoms associated with a lung issue are excessive crying, tightness in the chest, shortness of breath, asthma, frequent colds, skin problems like psoriasis and eczema and also circulation issues. In Chinese medicine the lungs are said to control the pores of the skin, so it is important to boost and protect the protection layer of the body. Worry is controlled by the spleen, and the spleen in Chinese medicine controls the energy of the body. We believe that when the spleen is too taxed, energy becomes stuck. Symptoms of spleen issues are fatigue, memory issues, poor appetite, bloating, weight loss, paleness, poor hair, nails and skin. Eating properly and frequently is very important when the spleen is affected, it’s important to give the body nourishment for the reduction of worrying. Don’t you feel so much better after you eat a meal when you’re worrying? Our DETOX supplements are both blood and energy boosting, assisting with clearing out some of this stuck energy. The main organ they play on is the spleen, so it’s a great way to move this emotion! The Bottom Line: Understanding what’s going on internally and what happens to the body and nervous system is very important for the long run. Help your body reboot with self-care rituals like drinking tea daily, acupuncture or meditation. Timing matters too! The Chinese Body Clock explains which organs jump into action at certain points of the day. Discover this fascinating ancient wisdom here! Share the post "Here’s The Strange Connection Between Your Emotions + Organs"
Please, make clear that the organ pictured on the right upper side is the stomach, not the spleen. ^^ lol I thought the same thing! this is truly one of the stupidest, most pseudo-science articles I’ve ever read. I think this is the end of my relationship with TCM, can’t handle this BS. Interesting to have read several articles about heart transplant patients developing new longings and thoughts after surgery; it was discovered there are “brain-type” memory cells in the heart besides the regular tissue muscle and these memory cells carry emotional thoughts. No doubt the other organs also have differential cells that relate to memory and emotions. Physically speaking it simply means each organ and its neuro pathway is unique, having its own identifying vibrational frequency similar to an instrument having a particular type of sound, yet part of a whole orchestra led by a maestro, the brain. That organ and its meridian will manifest its own vibrant energy or its own toxicity; corresponding feelings or emotions are various forms of energy. This list is seriously incomplete. As a basic principle, a specific emotion is associated with each meridian. Translating the Chinese emotional concepts into English presents a challenge, and these five are the easiest.